NetSaro allows you to create a private and secure instant messaging network, based on client-server architecture. 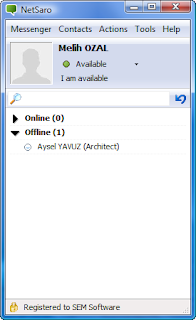 You can send and receive Message, Voice Message, File or Screenshot or start multi-user Chat Sessions. System access requires a valid User Name and Password. You may want to log messages between your users for auditing purposes. Client user interface integrates smoothly into the desktop.